The file labeled ‘Unused Product Features’ is, sadly, one of the larger ones in the file cabinet, bursting at the seams, and rivalled only by the likes of ‘Superhero Films Featuring Other Superheroes’ and ‘Supposedly Fun Things I’ll Never Do Again’. Imagine endlessly flicking through page after page of forgotten features, while adding up the millions and billions of wasted hours, dollars and dreams, only to see them fade away into oblivion. It’s too much; it’s bringing tears to my eyes. Anyway, I’m coming up blank trying to think of some good examples of potentially great features that didn’t deliver the desired impact - which I suppose is the best example of all. That’s because, frustratingly, it often isn’t the quality of the features that condemn them to the abyss, but the lack of public attention. Having spent so much time, money and effort on planning, developing and releasing new features, the next crucial step is making sure your customers are aware of their existence. 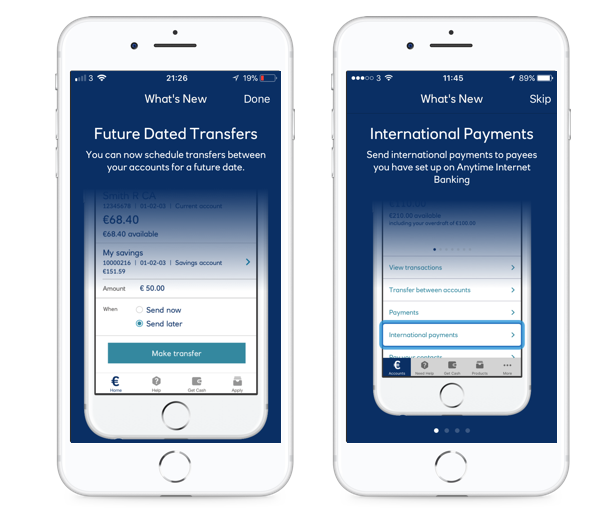 The problem for features in banking apps is (let’s not beat about the bush) that they’re not going to jump out to us as something exciting that we simply have to discover more about. I could be wrong, but I imagine very few of us spend our spare time scrolling and clicking through our banking apps to find out what functionality is lying there waiting to be used. Once we’ve figured out how to do something as utilitarian as a basic mobile banking task, like making a payment, we’ll close the app and get on with the rest of our day. And this is the way it should be; these types of functional apps are there to help us carry out tasks quickly and easily, not kidnap our attention. The natural curiosity that helps with organic discovery just isn’t there, meaning that important features can go unnoticed and unused. This is a problem for a number of reasons: other banks may be doing a better job of showing off new features, helping them to steal customers from underneath you; costs are not being reduced ; and you are not maximizing your revenue through app transactions. It goes without saying that highlighting key features should be a major part of your onboarding flow when a customer opens the app for the first time. However, impatience and short attention spans often cause customers to skip ahead, and when you add to this customers (like me) who have flaky memories, it makes a lot of sense to deliver gentle reminders in the app once the initial onboarding phase has ended. Tip overlays (a type of in-app message) are particularly useful for this, as they point out features in the context of the app to customers you know (through behavioral data) have not used them before. But it’s not good enough to simply point out the feature; you need to demonstrate its value to your customer. For example, when notifying customers about the option of paperless billing, explain that it is more secure, greener for the environment, and more convenient - then watch opt-in rates soar. Updates to apps are a necessity for a variety of reasons, but they are also an opportunity to release new features. 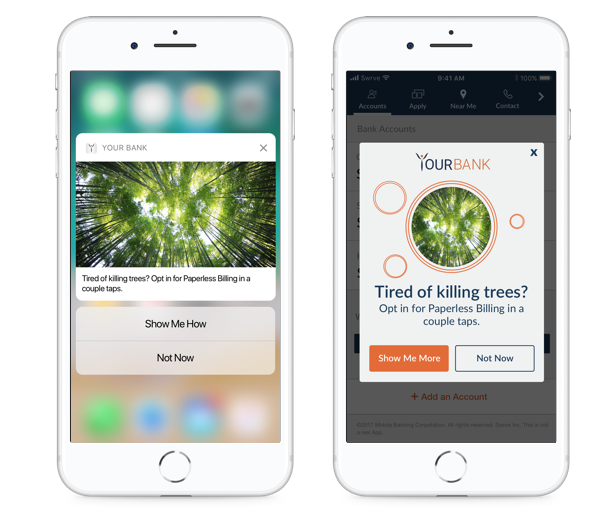 As a result, it’s imperative to deliver a ‘What’s New’ series of in-app messages that highlight and explain all the new features that make your customers’ lives that little bit easier. My bank did this recently, and it really made a difference to my usage. For instance, they notified me about the new ability to schedule transfers for a future date in the app, which I wouldn’t have known about otherwise. Catching customers at a bad time, like when they need to carry out a task quickly, can potentially lead to them skipping the new feature announcements, or at the very least not pay attention to them. Target these customers again at a later date if they still have not used any of the new features. The majority of everyday banking scenarios can be carried out through an app these days, and banks really want their customers to do just that. And rightly so - apps enable better interactions which can significantly increase revenue through much more targeted upsells and cross-sells. However, being creatures of habit, customers often ignore features in an app when they are used to doing them through a website. Fortunately there is a really powerful way to encourage them to step outside their comfort zone, using transactional push notifications. It works like this: when a customer carries out a transaction through your website, for example adding a new payee for the fifth time, you can trigger a push notification to their smartphone explaining how easy it is to add new payees through the app, deep-linking them to a page in the app that walks them through the process. Next time they need to add a payee, they are much more likely than before to do it through the app. Not all devices enable the full range of features that the app is capable of, and there are often certain things that can be done on Android, but that can’t be done on iOS, and vice-versa. This variation extends beyond operating systems to the individual capabilities of devices. For example, new features which are becoming standard in banking apps, like facial recognition or thumbprint sign-in, are not supported by older smartphones. It makes no sense to point out a feature like facial recognition to customers who can’t take advantage of it. Doing so would only waste their time and possibly lead to confusion. But for customers who do have devices that can take advantage of these new capabilities, it is well worth encouraging their use, especially if they have initially opted out of using them. For example an in-app message delivered to a segment of users with devices that support facial recognition sign-in, but have it turned off, can explain that it is a fast and secure way of accessing their accounts. Including a deep-link to the settings page where it can be turned on will vastly improve opt-in rates. These are just a few techniques that can be applied to encourage customers to take advantage of the rich variety of features that banking apps currently offer. I suspect the number of features will only grow as mobile continues to take the leading role in the finance industry as the primary channel for day-to-day banking and customer interactions. And as the number of features expand, the more important feature discovery and reminders will be to educate your customers on the banking possibilities they hold in their palm.